Yahoo has realised it has a problem: it's the most popular web-based email service, but it's running out of domain names. 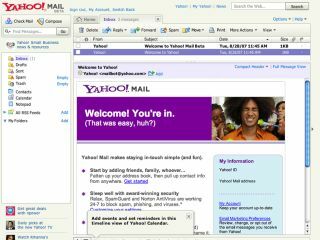 Some of you may remember the rocketmail.com service; Yahoo bought it in 1997, and by bringing it back the company is creating a "hip retro feel", according to Yahoo Mail Vice President John Kremer. "A happy user is one that stays around and is a Yahoo user for life," Kremer said. "If you have an email address that is your name at ymail that becomes part of your identity." But don't worry if you fail to register billy_big_biscuits@rocketmail.com, as Kremer also hinted there would be more domains available in the future based on Yahoo's other companies.